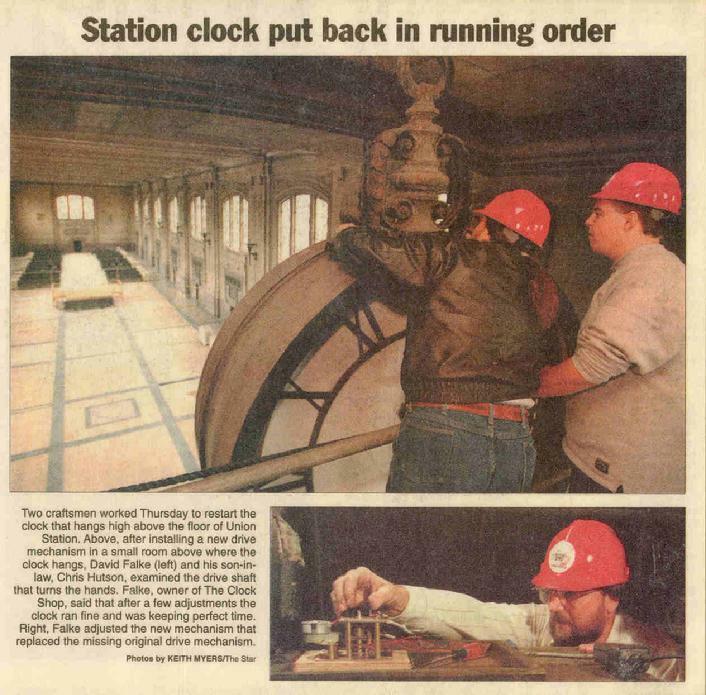 It's October 1996, I received a call from Andy Scott head the Union Station restoration committee, Dave, the vote for the restoration bonds will be November 5th, and we need to bring some attention to the Station. Alot of people remember the station's ceiling clock in the arch way, the common phrase was "meet me under the clock" The clock is not running right now, if you can get the clock running before the end of October, it might give us a coming back to life publicity that the Station needs right before the vote. I said I would try. It was a cold October morning, the station lobby doors were all boarded up we entered the Station through a small door on the side, it seems colder in the station than it did outside, there was no power in the Station, huge puddles of water on the marble floor, calcium deposits on the marble walls from water running down from the leaking roof. We went by flashlight as we travel up to the old boiler room above the clock. Traveling up the old staircase the walls were all pealing of lead paint, crawling under air ducks we come to a cast iron ladder, which takes us to the boiler room above the clock. Entering the room I see the drive shaft that turns the hands on the clock coming through the floor into a frame that housed the clock drive, there was no clock drive! Returning to the shop, I contact a company that specializes in clock tower drives, I order a drive large enough to carry six-foot hands, the ceiling clock has two sets of three and one half foot hands. The clock drive arrives, I have to alter the hand shaft to accommodate a swivel joint to attach to the drive shaft and I'm ready to install the drive. It's October 31st Halloween, I enter the station, the power is on, all the water puddles are gone, they have lights all the way to the old boiler room above the clock, they have built a scaffolding 85 feet up to the clock. There are video crews from three TV stations there to film the event. (No pressure) I install the clock drive; turn on the power-----and the hands wont move! I climb up the scaffolding to inspect the problem. The TV crews filming every move. The clock has been up there since 1917 and the building has shifted and has put the clock out of line with the drive shaft coming out of the ceiling, putting a heavy load on the shaft. A clock has a clutch that allows you to set the hands and the clock still stays in gear. I had to drill through the clutch and put steel pins in it to make it a direct drive, I take the clock drive back to the shop, and loose the TV crews. After fixing the clutch I return to the Station, all the TV crews are gone, after all no story! Only one reporter stays from the Kansas City Star, I install the clock drive, turn the power on----and the start hands turning, the drive shaft even though in a bind, the clock drive powers through with the clutch disabled, it worked! The next day the press is there to see the clock running again. If the bonds pass the drive shaft problem will be solved with the complete restoration of the ceiling clock. 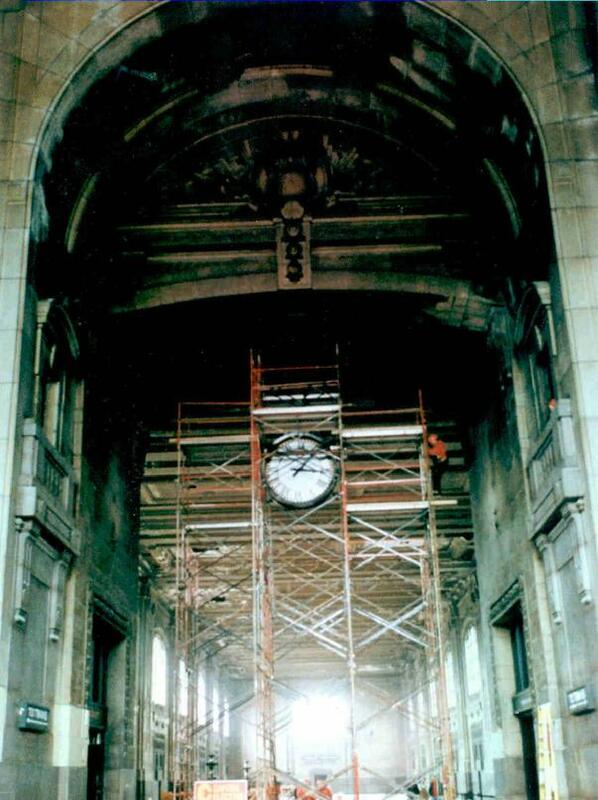 Four days later On Tuesday, November 5th 1996 the bonds pass, the restoration of the Union Station begins! There are two Clocks at the Station The Ceiling Clock in the archway and the Lamppost clock in front of the Station. They were both restored at the same time, this page will deal with the Ceiling Clock, click on the lamppost Clock menu to find out about the restoration of this Kansas city landmark and how you can see the old original clock works running today. Now back to the Ceiling Clock. 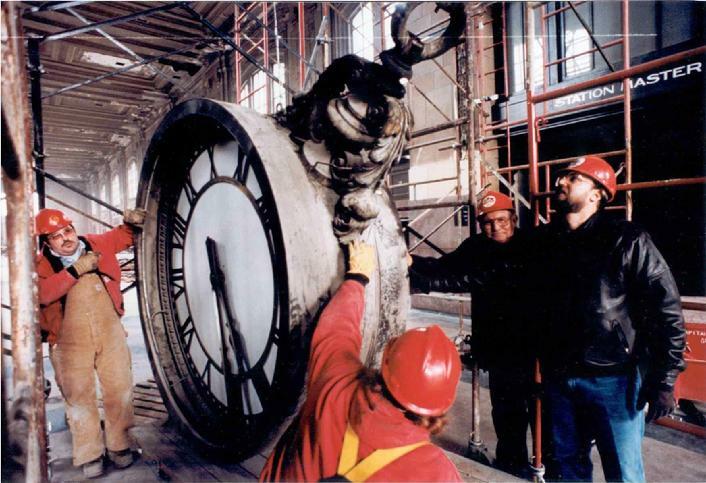 It's April 1998, it's time to take down the Ceiling Clock from the archway, that has been hanging there since 1917, the clock will be shipped to Medfield Mass, to The Electric Time Company they will rebronze the casing of the clock. The Capital Electric Company has the task of lowering a 1,200lb. Clock to the floor, but first they have to figure out how to detach it from the ceiling. The Clock is hanging from a single one and one half inch bolt coming out of the ceiling, at first it looks like the only way to detach the Clock is by turning the hole clock around counterclockwise until it comes off, but there is scaffolding surrounding the Clock so there is no way it can turn. And there was no one sill alive to tell us how they put it up in 1917, so after spending the day going over every possible way they decided the large ring at the top of the clock had to swivel at the clock then unscrew at the ceiling. They drill two holes through the floor of the old boiler room above the clock, dropping steel cables through the holes and attach them to each side of the clock, then wenches them up to take the weight off the screw, they use a steel pipe about five foot long, sliding it through the ring they start to turn it to the left it easily comes off the heavy bolt from the ceiling, it now is suspended on the cables, they start lowering it down to the floor. The picture on the left, the clock has been lowered about 25 feet from the ceiling on it's way down. The picture on the right shows the clock just moments after it touches the floor. The clock is prepared for shipping to Medfield Msss. for a facelift.